‘The best timber by far, for bows (in temperate Europe) is yew (taxus baccata), and many bows are known in this wood’ (Webb A., 1991). ‘In the days when perhaps an archers life depended on it, he would make sure that he had a good bow in his hand, and in most cases yew would be the wood he would choose’ (Adams D., 1988). The Meare Heath bow was made from yew, but how long did it take primitive bowyers to discover that yew was the best wood for the manufacture of the bow? How many years of trial and error went into the manufacture of bows before it was realised that yew wood was the wood for bow making? The Meare Heath Bow was cut from the trunk of a yew tree, but it is also possible, and far easier, to make a bow from a boughstave (a branch), but a bow created in this way would not be as good (due to the timber quality), but it would be a serviceable weapon (Adams D., 1988). The Meare Heath Bow was made from seasoned wood, bows however can be made quickly and effectively from unseasoned wood, although again they are not as good, because it is much harder to tiller them correctly, but it can be done. When thinking about acquisition of the wood for the Meare Heath bow then, it is important to note that the bow was made from the finest material available, and from the best part of that material. Bergman, McEwen and Miller, in their experimental archery paper, state ‘every bow and its arrows represent a unique adaptation of the available raw materials’ (1988, 658-70). The Meare Heath bow is a fine example of the maximum utilization of available raw materials to match the needs of the archer. The bowyer who constructed the Meare Heath Bow really knew how to get the best weapon for his needs out of the materials available to him, with the minimum of effort. The creation of the replica bow has proved that Neolithic bowyers were skilled enough to know the best tree for bowmaking, the best part of that tree, and the best way to treat the wood of that tree in order to get the best results for bow manufacture. Considering this, it can be argued that the bow probably played an important role in the lives of the Neolithic population of Somerset. A weapon as advanced as the Meare Heath Bow must surely point to very talented individual bowyers, or a bow making industry in a highly developed stage. If a bowyer today were asked to construct a self-bow using the best possible materials for the job, he could not get much better than to follow the lead of the Neolithic bowyers. The creation of the Meare Heath Bow replica shed new light upon the level of technology used in the creation of the original highly sophisticated bow. Bergman, McEwen & Miller, writing in 1988, stated that the bow actually accorded well with 20th century principles of scientific design; perhaps this should now be updated to read that the bow accords well with 21st century principles of scientific design. The Meare Heath Bow is a very efficient weapon, the wider limbs storing a great deal of potential energy, and more energy means a greater arrow speed (43m per second). The bowyers of the Neolithic knew how to fashion a very efficient weapon with minimal effort in a very short time. You do not learn such skills in an afternoon, and the Meare Heath bow is the result of the culmination of years of experience in making and designing bows. The Neolithic bowyers must have been highly skilled individuals, and the bows that they produced highly prized. Another point worthy of mention is the use of the transverse leather bands and the criss-cross webbing on the bow. It was previously believed that these additions were simply for decoration, possibly to create an outstanding weapon as a show of status, or that they helped to strengthen the bow, compensating in some way for the breadth and thinness of the stave (Clark J.D.G., 1963). The construction of the replica has shown that these bands actually had four functions: they allowed a very good bow to be made from a stave that would have broken without them; they help spread the stresses placed upon the bow when it is drawn; they help to silence the bow when an arrow is released, making the bow a very good hunting weapon; the binding at the bow’s tips not only helped to strengthen a weak area but also appeared to create an idol of sorts, the bound figure of a man, which perhaps held some special significance for the maker of the bow. These bands then, serve both functional and decorative purposes. The bow itself is a weapon, yet it is also an object of great aesthetic beauty. The makers of the Meare Heath bow were not only craftsman, they were also artists. The Neolithic period is generally accepted as being the age that marks the change from the Hunter/Gatherer society to that of the farming community. Bewley, in his book Prehistoric Settlements, when writing on the Neolithic states, ‘Normally we would label the people living in and around the Somerset Levels (and other similar areas) “farmers”, but we must not think of them as farmers in the modern sense of the word. They farmed some parts of the land, and were probably more settled than the communities living 500 or more years before. However, the evidence for them being farmers is slight indeed, and with the natural resources which the Levels would have provided, the need for farming was not great. Why grow food when you can obtain a plentiful supply (and variety) of food from the back garden?’ Bewley goes onto say ‘they were hunters as the Meare Heath bow shows’ (Bewley R., 1994). The bow’s weight is 42lbs (19kg) at 28″ (76.2cm) and its velocity is 43 metres per second, shooting and arrow with a projectile weight of 30g. This means that the bow is a fairly good hunting bow, with a poundage that would bring down most animals, accurate up to 100 yards. The hunters of Neolithic Somerset, using the Meare Heath Bow, would have been able to kill a deer at 50 metres in just over a second, and what’s more, with a silent bow, if they missed the animal, and it did not see the arrow, they might even have been able to get off a second shot. Another use for the bow could possibly have been for personal protection. Crickley Hill, a later Neolithic settlement, defended by an enclosure, met its end in violence, as shown by the scatter of leaf-shaped flint arrowheads along the rampart, fanning out into the interior of the enclosure from the gates (Bahn P., 1992). Some 429 arrowheads were recovered during excavations (Gale J. 1985). ‘At enclosures such as Crickley Hill (Gloucestershire), Maiden Castle and Hambledon Hill (Dorset), numerous arrows appear to have been fired during attacks and many bear impact fractures indicative of use’ (Edmonds M., 1995). The Meare Heath bow in this situation would have made an impressive and terrifying weapon of war, easily capable of killing a man. Perhaps the size, style and design of the weapon was cunningly crafted to act as a status symbol for the owner, striking terror into the hearts of the tribe’s enemies. The disposal is perhaps the most interesting of all the facets of the bow’s history. It was thought for many years that the Meare Heath Bow had broken in use and had been thrown into the bog, perhaps by a disgruntled hunter. This appears to have been the fate of the Rotten Bottom Bow from Dumfriesshire, Scotland (National Museum of Scotland info. leaflet). When the evidence connected to the break in the handle of the Meare Heath Bow is weighed-up however, it seems to suggest that the bow was deliberately broken. It is most likely that the bow was unstrung, the handle scored with a flint tool, the bow turned over and then snapped over something hard, like over the knee, but the question that remains to be answered is why? 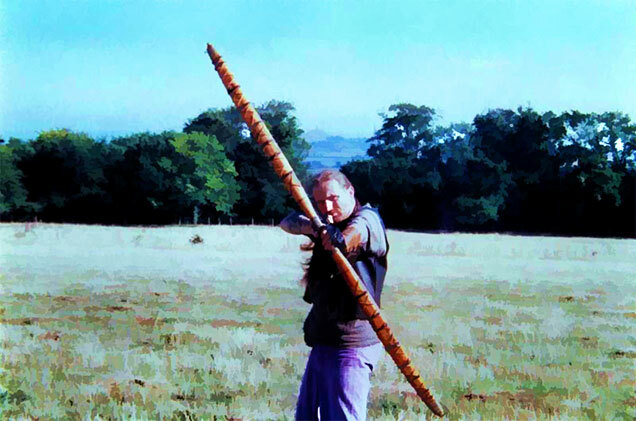 There is little question that the Meare Heath Bow was an outstanding weapon, both in its design and in its artistic beauty, so why would the Neolithic owner of the bow wish to break such a fine weapon and then discard it in the marshes of Somerset? There are many possibilities for the bow’s demise, but the two most likely are that the bow was either some sort of ritual deposit, such as a votive offering, or it was disposed of in an act of denigration. The ritual deposition of votive artefacts is a practice known to archaeologists the world over and such deposits can be traced back thousands of years. Appraising the evidence for other votive deposits, it seems clear that the Meare Heath Bow shares similarities with them, especially in the way in which the bow was treated prior to deposition and where it was actually deposited. Prior to deposition many votive offerings, especially weapons, are ‘ritually killed’, i.e. broken to take them out of normal usage and out of the bounds of this realm (Bradley R., 1990). There is no doubt that the Meare Heath Bow fits the description of a ‘ritually killed weapon’, as it is most likely that the bow was purposefully cut and then snapped. When looking at where the bow was deposited ‘it is true that the finer weapons are often found separately from other groups’ (Ibid.) and that ‘ritual deposits occur in special locations away from settlements’ (Levy J., 1982), both these factors are true of the Meare Heath Bow. It must also be noted, that the Meare Heath Bow was found close to a Graig LLywd stone axe, which may also be of importance, as ‘exotic’ polished stone axes are often found deposited as part of votive hoards (Bradley R., 1990). There are also other artefacts from the Somerset Levels that may be votive deposits, such as the God-Dolly (mentioned above). Judging by the evidence, it seems likely that the Meare Heath Bow was broken and thrown into the bog as a votive offering. If the bow was cast into the bog as a votive offering what was the depositor’s intent? We can only guess, but the bow’s deposition could have been the result of an offering to the spirits of a higher realm, such as ancestral spirits or Gods, or perhaps it was deposited in an act of remembrance. ‘Worship makes demands on the celebrant. These include not only words and gestures of prayer and respect, but often active participation, involving movement and perhaps eating and drinking. Frequently it involves also the offering of material things to the deity, both as sacrifice or gift’ (Renfrew & Bahn, 1993, 359) and ‘virtually all Hunter-Gatherers rely on gifts to create and maintain alliances’ (Hayden B., 1992). It is a possibility then, that the Neolithic owner of this bow sacrificed it as an offering to his gods or his tribe’s ancestral spirits, to placate their friendliness towards him: or perhaps the bow was sacrificed upon the death of its owner in an act of reverence to his memory. If the bow was not broken in an act of reverence to the gods, or to its owner’s memory, what then remains to explain why we now have only half a bow? The other likely explanation is that the bow was broken in an act of denigration. It is known that warfare occurred in the Neolithic period, so perhaps the owner of this bow had been involved in a skirmish or battle of some sort, or had killed someone that he shouldn’t have! In this scenario, it is not difficult to imagine his capture and his humiliation at the hands of his captors when his bow was confiscated, scored, snapped and then cast it into the marsh in an act designed to belittle him! We will never know the real reason for the destruction and deposition of the bow, but its deposition was a fortuitous event, for without it we would never have had the chance to study such a remarkable weapon (Fig. 11). The people of the Neolithic are already known to us through the archaeological record as skilled hunters, farmers, animal rearers, builders, potters, flint knappers and carpenters (Cunliffe B., 1994), with this in mind it should come as no surprise to learn that these people were also skilled bowyers. What was discovered through the manufacture of the Meare Heath Bow replica however was just how skilled at bow making these people actually were. The Meare Heath Bow is a truly amazing weapon, and when the facts are drawn together allowing a picture of the bow’s history to emerge, great appreciation for the skills of the Neolithic bowyers is gained. The Meare Heath bow is an artefact that shows just how skilful and resourceful our ancestors could be. Adams D. 1988. Making The Boughstave Longbow. Lincoln: Flare. Bergman C.A., McEwen E. & Miller R. 1988. ‘Experimental Archery: Projectile velocities and comparison of bow performances’, Antiquity, 62: 658-70. Bewley R. 1994. Prehistoric Settlements. Batsford/English Heritage. Bradley R. 1990. The Passage of Arms. Cambridge: Cambridge Uni. Press. Clark J.D.G. 1963. ‘Neolithic bows from Somerset, England, and the prehistory of archery in north-western Europe’. Proceedings of the Prehistoric Society, 29: 50-98. Clark J.D.G. & Godwin H. 1962. ‘Prehistoric ancestors of the weapons which brought England victory at Crecy, Poitiers & Agincourt: Neolithic Long-bows of 4500 years ago found in the Somersetshire peat’. The Illustrated London News, February 10th, 1962. Coles J.M. & Coles B.J. 1989 (a). The People of the Wetlands. London: Guild Publishing. Coles J.M. & Coles B.J. 1989(b). Prehistory of The Somerset Levels. Somerset Levels Project. Cunliffe B. (Ed.). 1994. The Oxford Illustrated Prehistory of Europe. Oxford: Oxford Uni. Press. Edmonds M. 1995. Stone Tools and Society: Working Stone in Neolithic and Bronze Age Britain. Routledge. Gale J. 1985. The Flint Arrowheads from Crickley Hill, Glous. Unpub. Undergrad. Diss., Uni. of Norfolk. Hardy R. 1976. Longbow. Cambridge: Patrick Stephens. Hayden B. 1992. Archaeology: the science of once and future things. New York: Freeman & Co.
Heath E.G. 1971. The Grey Goose Wing. Reading: Osprey Publications. Klopsteg P. 1947. Turkish Archery and the Composite Bow. Evanston. Levy J. 1982. Social and Religious Organisation in Bronze Age Denmark: An analysis of Ritual Hoard Finds. Oxford: BAR Series 124. Philpot J.H. 1897. The Sacred Tree. Felinfach: Llanerch Publishers. Pope S. 1974 (reprint of 1923 ed.). Hunting with the Bow and Arrow. New York: Popular Library Edition. Prior, S.J. 2000 (a). ‘The Skill of the Neolithic Bowyers – Reassessing the past through Experimental Archaeology’. Somerset Archaeology, 19-24. Webster, C.J. (ed. ), Taunton: SCC. Prior, S.J. 2000. 2000(b). ‘Recreating the Neolithic Meare Heath Bow – Reassessing the past through Experimental Archaeology’. Journal of the Society of Archer-Antiquaries, vol.43, 44-48. Rausing G. 1967. The Bow, some notes on its origin and development. ACTA Archaeologica Lundensia. Renfrew C. & Bahn P. 1993. Archaeology, theories, methods and practise. Thames & Hudson. Spindler K. 1993. The Man In The Ice. Phoenix. The Rotten Bottom Bow: The story of Britain’s oldest bow. The National Museum of Scotland Info Leaflet, 1997. Waldorf D.C. 1985. The Art of Making Primitive Bows and Arrows. Branson, MO. USA: Mound Builders Books. Webb A. 1991. The Archaeology Of Archery. The Glade & Dean Archaeological Group. We’re both natives too Pat, and ‘Levels’ is what we call ’em.